Often the term COPD is used to describe chronic bronchitis and emphysema, 2 progressive lung diseases which can occur by themselves or together. The most common form of COPD is a combination of the 2 conditions. COPD causes increasing shortness of breath, leading to difficulty carrying out the activities of daily living and a reduction in quality of life. COPD usually affects people older than 35-40 years of age, but is often not diagnosed until people are in their 50s. Chronic bronchitis is, as its name suggests, a chronic (ongoing) inflammation of the airways (bronchi) in your lungs. It is defined as a cough that produces sputum occurring on a daily basis for at least 3 months of 2 or more consecutive years. Bronchitis results in the lungs producing too much of the mucus they make to keep the bronchi moist. This causes coughing and constriction of the airways, making it more difficult for air to flow freely. As a result, you become breathless. Although many people contract acute (short-term) bronchitis at some time in their lives, chronic bronchitis lasts for months or years. Emphysema occurs when the air sacs (alveoli) deep in your lungs become enlarged and damaged. This makes oxygen transfer from the lungs to the bloodstream less efficient. Eventually the alveoli collapse which means that they don’t prop open the microscopic airways called bronchioles. This makes it extremely difficult to breathe in and out. The symptoms of COPD usually develop slowly over several years. a productive cough (coughing up mucus or phlegm) on most days. People with COPD usually have exacerbations (flare-ups), which means that they have episodes when their symptoms are worse than usual, often caused by a respiratory tract infection, such as a cold. how frequently you have flare-ups. a ‘barrel-shaped’ chest from emphysema. The vast majority of cases of chronic obstructive pulmonary disease are caused by long-term smoking. In fact, one-quarter of all smokers will develop COPD. Passive exposure to smoking, especially during early childhood, also increases your risk of developing COPD. In some cases COPD can result from long-term occupational exposure to dust or chemical fumes. Air pollution can also contribute to the development of COPD and aggravate the symptoms. There is also a rare type of emphysema known as alpha-1 antitrypsin deficiency-related emphysema, a genetic condition in which a person’s body lacks a protein called alpha-1 antitrypsin. This protein normally helps protect the lungs. Smoking hastens the speed at which emphysema develops in people with alpha-1 antitrypsin deficiency. if you had problems with your respiratory system (airways and lungs) in childhood. Your doctor may recommend the following tests to help make a diagnosis of COPD. Lung function tests. Spirometry is a test of lung function that involves breathing into a machine called a spirometer. The main measurements used to diagnose COPD are the total amount of air you exhale and the amount you exhale in one second. 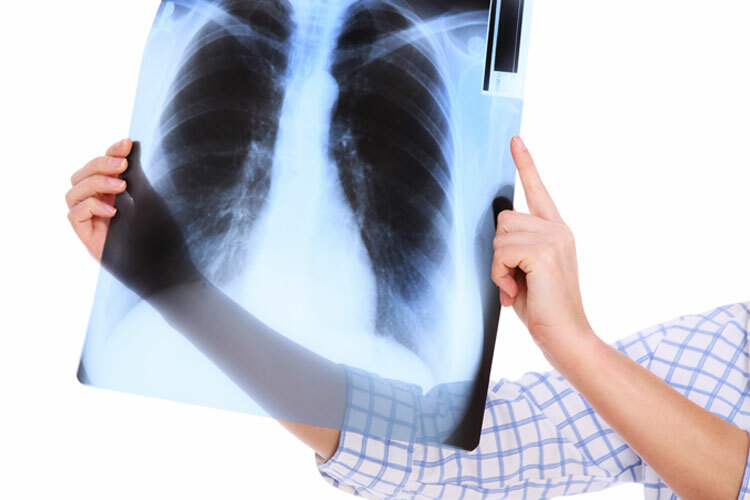 A chest X-ray or CT scan can show features that suggest you may have COPD. These imaging tests can also help to rule out other conditions that may be causing your symptoms. Arterial blood gas measurements can measure the amount of oxygen and carbon dioxide in your bloodstream to help assess how well your lungs are working. It is a good idea to see your doctor for an assessment if you are older than 35 years, have ever smoked and are experiencing the following symptoms. If you are short of breath compared with other people the same age as you. At first, this is usually noticed only during physical activity. If you have a productive cough (coughing up mucus) that affects you several times a day on most days. If you seem to have frequent respiratory tract infections (such as colds that cause coughing). Having COPD can put you at increased risk of several other conditions, but you can work with your doctor to stay as healthy as possible and detect and treat problems early. osteoporosis (a condition where bones become less dense and strong, leading to an increased risk of fractures). COPD is a progressive condition and unfortunately there is no cure for it. It also isn’t possible to reverse lung damage that’s already been done. However, there are treatments available to help improve lung function, relieve symptoms and slow down the progression of the disease. By far the most important thing you can do for yourself if you have COPD is to quit smoking immediately. You may have tried to in the past, but if you have been diagnosed with COPD, it is even more important that you talk to your doctor about stopping. You will improve your cough, ease your breathlessness and you’ll also slow down further lung damage. See your doctor if you are concerned about chronic obstructive lung disease – early diagnosis and treatment can help improve outcomes. 1. Abramson M, Frith P, Yang I, et al. COPD-X concise guide for primary care. Brisbane. Lung Foundation Australia. 2014. http://copdx.org.au/ (accessed Feb 2016). 3. MayoClinic. COPD (updated 21 Jul 2015). http://www.mayoclinic.org/diseases-conditions/copd/basics/definition/con-20032017 (accessed Feb 2016). 4. National Heart, Lung and Blood Institute. What is COPD? (updated 31 Jul 2013). http://www.nhlbi.nih.gov/health/health-topics/topics/copd (accessed Feb 2016). 5. NHS Choices. Chronic obstructive pulmonary disease (updated 1 Oct 2014). http://www.nhs.uk/conditions/chronic-obstructive-pulmonary-disease/Pages/Introduction.aspx (accessed Feb 2016).